The Contemporary Art Society has acquired Tall Vase (2006) and Three Jugs (2007) by Simon Carroll (1964-2009) for Amgueddfa Cymru – National Museum Wales. The selected pieces represent Carroll’s work at its most ambitious. The grouping illustrates his practice of working in series with a given form, in order to discover expressive variation. The museum hopes that this acquisition will contribute to a collection that celebrates ceramics as an important, diverse and vibrant contemporary art medium. The artist’s works go beyond conventional thinking and disciplinary boundaries. His approach is remarkable for his free and expressive use of trailed slip, and can be compared interestingly with other slipware in the Amgueddfa Cymru collection of work exploring clay as an expressive material. He was fascinated by touch and developed his awareness of how clay could be used directly and instinctively, by spending time with blind students in the early 1990s. 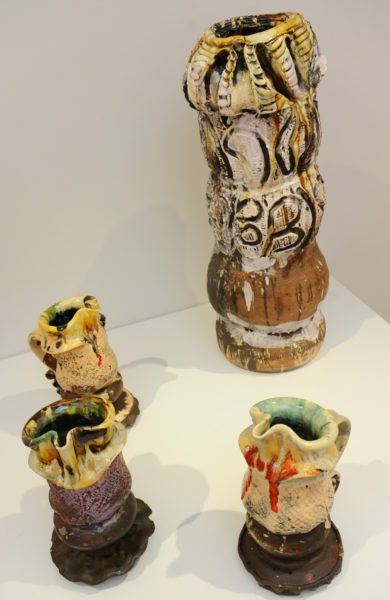 Carroll’s work deconstructs the history of ceramics, particularly Staffordshire slipware, and breaks all conventions of the highly finished form. He builds up surfaces with various slips, glazes and rich paint, with mark-making also becoming an important element of his artistic approach. His indulgence in the joy of exploration and process calls into question the role of ceramic art altogether. Carroll was an unconventional, multifaceted artist, who, among many things, experimented with ‘head throwing’ and beach painting. He was particularly interested in outsider art and abstract expressionism. In 2015, his work was shown in a posthumous retrospective exhibition at the Victoria and Albert Museum, London, and Ruthin Craft Centre.